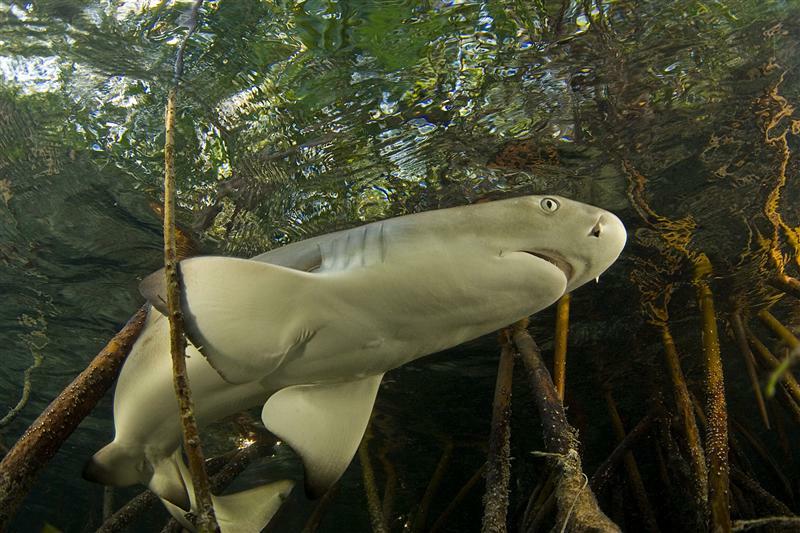 Young lemon sharks use mangroves as a nursery area. Photographer Matt Potenski from the Bimini shark lab and I are snorkeling among the mangrove roots in the Duckpond, an embayment a short boat ride from the lab. 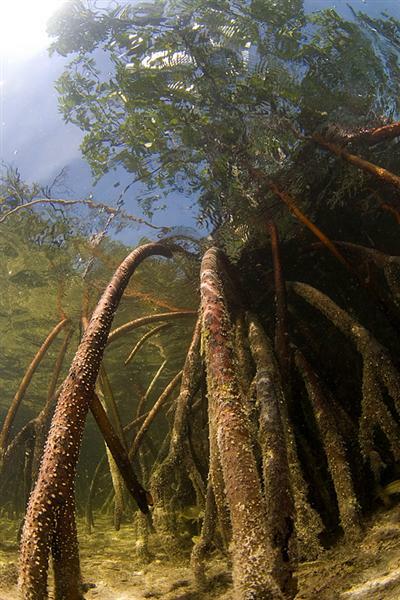 The prop roots of red mangroves (the primary species here) form cloisters and grottoes through which fish glide like birds through a woodland. 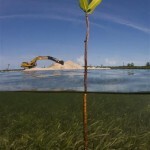 In a place like this you can understand how effective mangroves are as a nursery area. Fish simply melt into the forest. The roots themselves are thickly encrusted with brick red fire sponge and other filter-feeders. Clusters of mangrove oyster grow at low-tide level. Many roots are not attached to the seabed, and bob and sway gently in the current, as if the mangroves were dangling their toes in the tide. On the seagrass beds beside the mangroves are hundreds of upside-down jellyfish of the genus Cassiopea—a type of jellyfish which appears to wish it were a sea anemone, because it lies on its “back” (the bell) with its frilly tentacles pointing upwards. 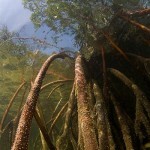 The red mangrove's labyrinth of roots makes it an ideal fish refuge. In some areas the seabed has been turned into volcanoes of sand, each about the diameter of a football. These mini-Vesuviuses are the excavations of a tubeworm which burrows deep into the substrate. The lab manager told me that if you’re really quick with a shovel you can dig up the worm, but usually it retreats to the bottom of its tunnel quicker than the shovel can dig. I figure I don’t need to see a worm badly enough to destroy its home. Clearly, though, another shovel operator doesn’t share this sentiment. In the middle of the Duckpond a digger and a front-end loader are hard at work building a causeway across the water. They are about two-thirds of the way across. Matt is flabbergasted. Despite the fact that Bimini has been a battleground between developers and conservationists for years, the impression I’ve been getting from Sharklab staff is that progress is being made. At the beginning of this year a marine reserve was declared on the eastern side of the island, which will safeguard a large area of mangroves from a developer’s dreams. Now, almost within earshot of the lab, someone is playing fast and loose with heavy machinery. Reclamation in the Duckpond threatens mangroves and seagrass with changes in hydrology and smothering by sediment. The outgoing tide is picking up speed and carrying a plume of sediment from the earthworks out into the lagoon. Where we were following fish through the mangrove labyrinth 30 minutes earlier, now we can’t see a thing. In the afternoon we take a boat trip through mangrove areas in North Bimini. 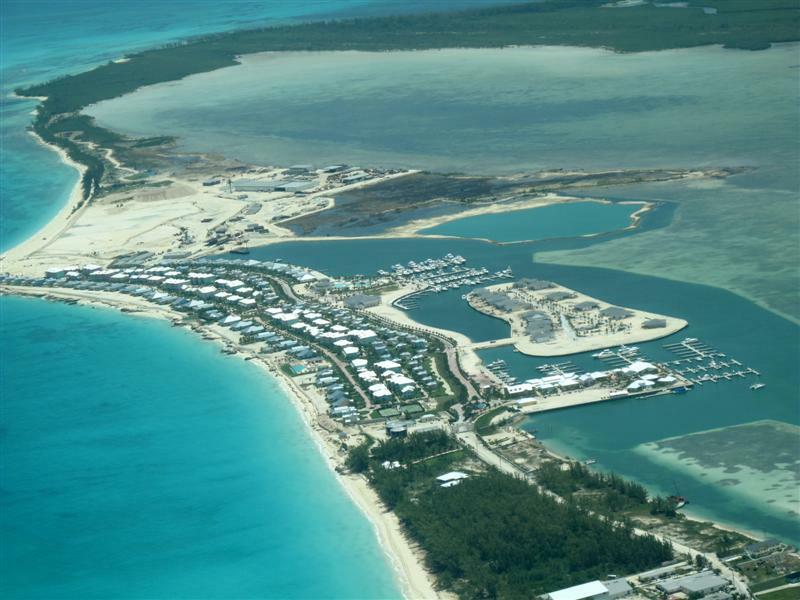 (Bimini has two halves, North and South. 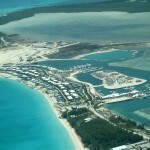 The town and the largest resort are on North Bimini; the lab is on South Bimini.) 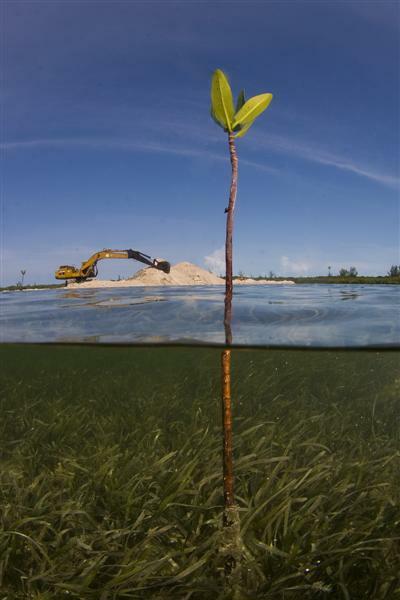 Some of these mangroves were slated for a golf course for the Bimini Bay Resort, an upscale behemoth that in its original incarnation would have brought 6000 visitors to an island with a population of 1600. The establishment of the marine reserve may have taken the golf course out of the equation, but most of the mangroves we’re passing do not enjoy reserve protection, so are still “in play” as far as development options are concerned. 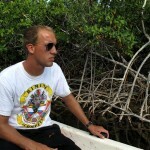 Grant Johnson among the mangroves of North Bimini. We pass a smart launch on the outer coast, but mostly we are alone in the mangrove channels. From the bow of the skiff I see barracuda and spotted rays, jacks and conch, the shellfish which is a Bimini delicacy, and whose empty shells are a universal landscape feature. A green turtle speeds away from the boat, launching itself out of the water with a splash before diving into the shadows. Bimini Bay Resort, Bimini's elephant in the room. We pass a dyke meant to confine sediment from an area of current construction. The high tide is lapping over the top. Grant shakes his head, as if to say “Can’t these guys do anything right?” Bimini is far from the Bahamas’ central government in Nassau, and there’s still a frontier flavour to the place—the very spirit that attracted Hemingway in the 1930s. 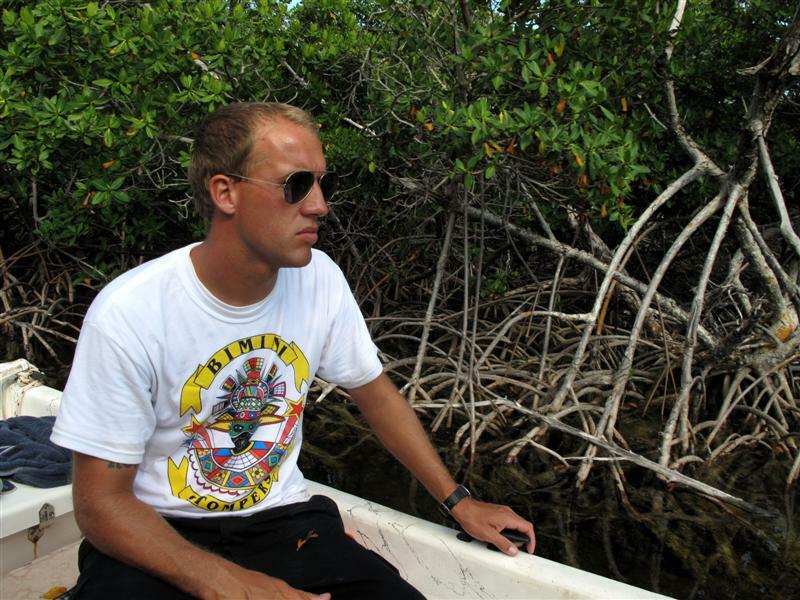 Grant would like that frontier to be a nature one—see the sharks, swim with the dolphins, kayak through the unspoiled mangroves. 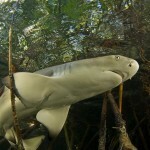 If you’re lucky, spot a Bimini boa or a sawfish. I notice that he has the word “Hope” tattooed on his arm. That’s the operative word for the mangrove-lovers of Bimini.